Finding the right sedan should first start with finding the right brand, and once you test the German-engineered excellence of a VW, you may never shop anywhere else again. 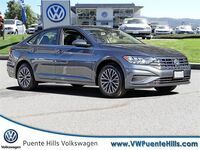 See what we mean for yourself and try a 2018 Volkswagen Jetta in West Covina, CA at Puente Hills Volkswagen. If you’re looking for features, then the Jetta will not leave you disappointed. Not only does it come with a color touchscreen, daytime LED running lights, and a rear-view camera all standard, but it also has plenty of available options including keyless entry, push-button start, dual-zone climate control, and more! You can find many of these features in our new Jetta inventory by clicking the link below. If you would like to learn more about 2018 Jetta performance and trims, then keep reading. When it comes to the VW sedan lineup, the Jetta is the smallest and most affordable sedan there is, and though it may be considered a compact, it’s much larger than you might think. That’s because it’s the smaller Golf hatchbacks that tend to fill the compact car slot in the Volkswagen lineup. This makes the Jetta ideal for someone looking for a fully-featured four-door sedan at a lower price. Just because it has a lower price, doesn’t mean it lacks under the hood. In fact, there are three engine options here, and all of them are turbos. For starters, you have a 1.4-liter turbo with 28-city mpg, 40-highway mpg, 150 horsepower, and 184 pound-feet of torque. The next step up is a 1.8-liter turbo with 24-city mpg, 33-highway mpg, 170 horsepower, and the same 184 pound-feet of torque. At the top of the performance spectrum, you can equip a 2018 Jetta with a 2.0-liter turbo monster that not only outputs 201 horsepower and 207 pound-feet of torque, but it also manages to achieve 24-city mpg and 33-highway mpg. There are a total of six trim levels for the 2018 Jetta. The lineup starts with the base model S trim and goes up from there with the Wolfsburg Edition and the SE. Those three all come with the 1.4-liter engine. After that, you have the SE Sport and the SEL which both have the 1.8-liter engine. The top trim is the GLI and it also gets the top 2.0-liter engine. If you need help finding the right trim or the right features, then Puente Hills Volkswagen would be glad to help. With our location in City of Industry, CA, we are just a short commute from West Covina. Come to see us today! 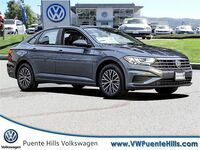 Interested in a 2018 Volkswagen Jetta?